Feeling the weight of holiday festivities? Too many cookies and rich food taking its toll? This little number worked for me last night. I have been reading good things about sweet potato noodles lately. Some accounts put them ahead of mung bean glass noodles, a longtime favorite. Described as clear, thicker than bean threads, slightly chewy and slippery; all of this caught my attention. I’m not going out on a limb and advocating them for a paleo diet, that’s not my focus. I’m looking for light, somewhat filling, a canvas for other foods. Yesterday I headed to my favorite Asian market and sought out the advice of the owner. I left loaded with the sweet potato noodles and a few other items to go along with them. 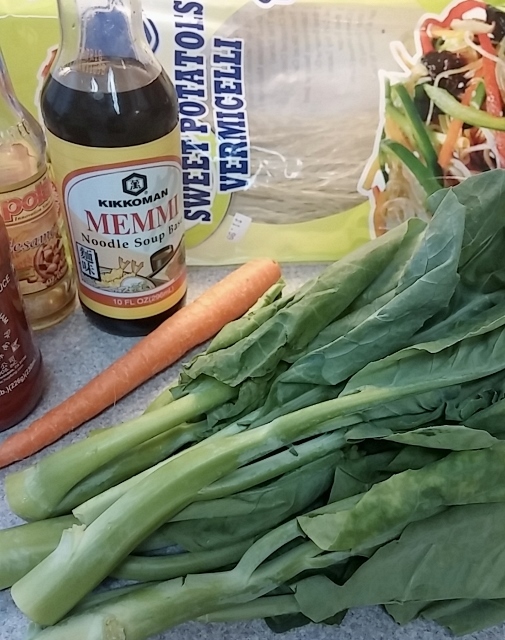 Her point was that you can make a quick, satisfying meal with just a few handy items: your favorite noodle, Memmi—a popular Kikkoman style soup base, perhaps sriracha for additional seasoning, vegetables, and any other protein that inspires you. While at the vegetable cooler she recommended kai-lan, a baby bok choy looking item with thicker broccoli-like stems. She suggested slicing the stems up and cooking them first and then adding the tops, which take no time at all. Any of the baby Asian greens will do, but the kai-lan has a sweet, mild quality which works nicely here. I was a little dubious at the frozen case when she pointed out all sorts of gray meat balls and tiny sausage shaped items. 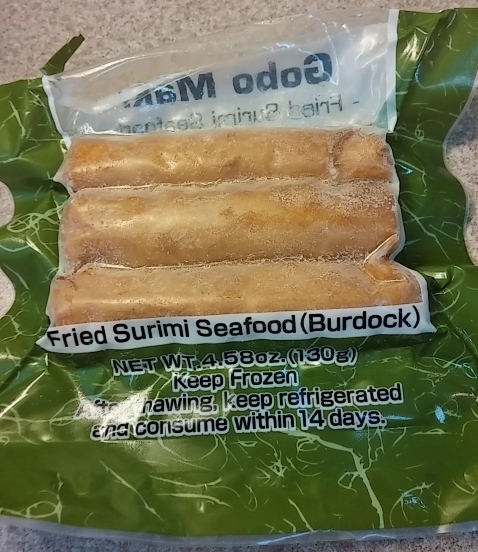 But, in the spirit of the moment I went for gobo maki, a fried sausage seafood on the order of crab surimi that’s made with bream and burdock. Since it is cooked, simply add it to the noodles at the last minute. She claims all of these choices are mildly flavored to absorb seasonings of the base blend. When dinnertime rolls around, all it takes to pull this together is a soup pot of boiling water and about 10 minutes. There’s no stir-fry or fussing around with inventive steps. It’s probably what Top Ramen is probably supposed to be: A few good noodles, some fresh veggies, and just enough broth to make it all extremely slurpable. For the seasoning blend: In a small bowl combine the noodle base, sesame oil, and sriracha and part of the water to thin. To prep the vegetables: Trim the ends of the kai-lan and slice the stems into ¼” thick ovals and slice the greens into 1” wide strips. Peel the carrot; using peeler continue to slice into long peels. Slice the green onion at an angle into thin ovals and set aside. To cook the noodles: Bring a medium pot of water to a boil. Add the noodles and cook for 5 minutes, stirring to break up. When they are tender all the way through (don’t overcook) scoop into colander, drain and rinse well. Cut into shorter lengths with scissors. Place them in a soup bowl and toss them with the seasoning blend. 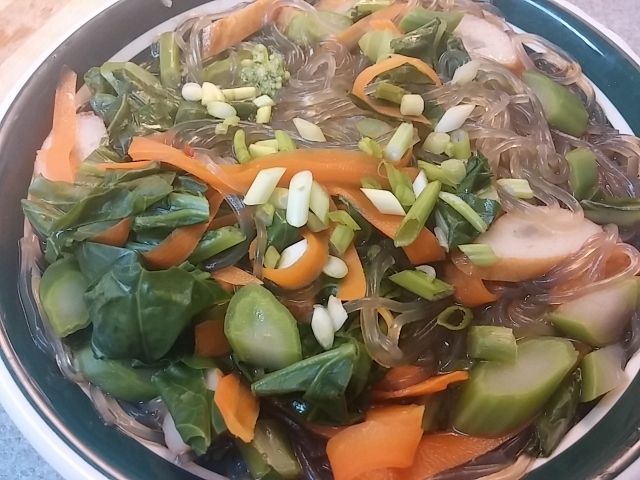 To blanch the greens: After the noodles have been removed from the lightly boiling water, add the thicker stems of the kai-lan and cook a minute or two before adding the leaves and carrot. Cook a minute or two longer until all are tender-crisp. Remove to drain lightly and add to noodles in bowl along with surimi or shrimp, tossing to combine. Adjust the preferred amount of broth with additional hot water. Sprinkle with the green onion and season further with sriracha or salt and pepper to taste.